DR ANNA Mokgokong, chairwoman of Community Investment Holdings, recently won the SABC Capital City Business Leader of the Year Award for 2014. Mokgokong's entrepreneurship skills date back to her childhood when she sold sandwiches at school. Later, as a medical student, she started a retail business selling leather handbags. Decades later she now has various business interests and a multibillion-rand empire in sectors such as healthcare, technology, logistics, mining and energy. In a statement issued after accepting the award at a dinner in Pretoria last Wednesday, Mokgokong spoke about the need to create more entrepreneurs. "With more than 50000 small and big businesses owned by black entrepreneurs, the metro already contributes close to 8.5% to the GDP of South Africa. Big business needs to come forward and be counted so entrepreneurs can contribute more fully to the city's economy," she said. The award honoured her contribution in business and recognised her spirit and determination to uplift and empower communities around Pretoria. The SABC Capital City Business Leader Award recognises entrepreneurs who demonstrate extraordinary success in their areas of business, with a personal commitment to the city and their communities. Mokgokong is a recognised leader in the community and has received numerous international awards for her business acumen. 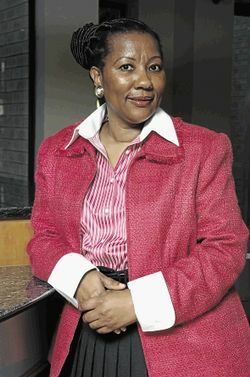 She was president of the South African Women Entrepreneurs Network, and the International Women's Forum of South Africa. She joined the Women Leadership board of the Harvard JF Kennedy Business School in Boston in 2002. She was also honoured by Star Group of the United States as one of the 50 Leading Women Entrepreneurs of the World in 1998 and 2002. Back home she won South Africa's Businesswoman of the Year award in 1999. In 2010, she was invited by former US president Bill Clinton to become a member of the Clinton Global Initiative. "We need to move away from the idea of relying on the government and the private sector to provide employment for our young people," she said. "Entrepreneurship and self-employment are the more attractive options."